The IR-Si Series are designed for those customers who require higher temperatures and greater output from their infrared source. These emitters are manufactured using a patented silicon nitride and silicon carbide material. The advanced ceramic technology ensures a very stable product. Their robust design ensures intrinsic physical and thermal strength. 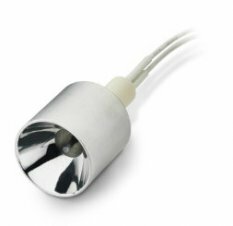 The IR-Si emitters can be supplied with parabolic reflectors for extremely efficient collimation of energy and complimented with windows for particular transmitting range, as well as with elliptical reflectors.